Please help - all suggestions/advice welcome! Kalico created the topic: Please help - all suggestions/advice welcome! Jake is a 2y 6m Beddy x Whippet - he is very slight and weighs around the 13kg mark. He has never been a great eater but goes through periods of vomiting bile in the morning - his stomach sounds very loud and is obviously sore - he stares at walls and is generally upset by this. This has happened on/off since he was about 6m old. He is neutered and was done at 4m. The last twice he has had sicky episodes, he has been treated with Metronizadole and has responded well - the periods were about 6m apart. He had a bit of an accident 3w ago and ran through a fence taking the skin off his front leg and bruising his chest, although i am sure there is no link between the two - since then he has been eating very poorly. He was put on a fortnight's course of Metronizadole, was given Ranitidine to take and was given a jag of steroids to try to counter any pain and to also help boost his appetite..for the first week this seemed to be having the effect that it had had the last twice, however, since Sunday he has barely eaten by choice - short of force feeding him, he would be starving by now - he is a very, very sensitive little dog and he is now running away from me if he sees me approach him with food. I have tried every food known to man to try to encourage him, eggs, cheese,chicken, steak, the meat ball things suggested on the other thread, various types of high protein dog food - you name it, i've tried it - he just turns his head and either goes back to sleep or gets up and leaves. I feed him separately from my other 6 dogs as he is a very slow eater normally and they are all like vaccums. I've tried feeding him in different rooms, out of different bowls, inside, outside..everything. In all other ways he seems normal, he is lively enough, his coat, body condition is good - he wants to run and play - he just doesnt want to eat. I am finding it really hard going as i just feel helpless and dont know what else to try. We took bloods from him last night and they are on their way to the lab this morning - depending on the results of the tests a decision will be made to scan and/or xray. He was given another short acting jag of steroids last night to see if this would boost his appetite in any way. We have also tried Periactin in the past to stimulate an appetite. I have read the other thread re the D/H not eating with interest and am relieved they have got a reason for her inappetence. Any thoughts/opinions would be greatfully received. poppy replied the topic: Re:Please help - all suggestions/advice welcome! I personally would not be without "slippery-elm"
It puts a silky linning on the entire gut. It works best if it is cooked. Even just 1 teasp. mixed with apple juice, a little honey and a pinch of salt. Just boil for a few mins. I would try to keep up the fluids. There must be a problem some where inside I would think. Animals that are in pain will chew on willow bark. If there are any willow trees around, someone may get some sticks for you. The hardest thing is to try to stay calm, just one teasp at a time and stroke his throat. Hopefully the scan will come up with something. My understanding is that steroids actually make dogs very anxious and jumpy. Kalico replied the topic: Re:Please help - all suggestions/advice welcome! I have slippery elm capsules..would they work the same? Bizarelly he has just eaten this morning - i suspect this is due to the steroids he was given last night - someone with a Lurcher suggested that i only put tiny amounts of food in his bowl at a time - so by himself this morning he has cleared 4 cubes of cooked mince, half a chicken breast and a small tray of Butchers..i know this isnt long term but it was such a relief to see him eat without any intervention. I have been told that slippery elm is many, many times more effective if it is cooked. I have found this to be true. Yes, very small amounts would be best. The main thing would be to keep up the fluids. Sid replied the topic: Re:Please help - all suggestions/advice welcome! Oh no, not wee superJake! I'd go for a scan asap if funds/insurance permit - best to know what you're dealing with, I always think. I have no experience with slippery elm, though many people swear by it, but if it works, then go for it. If all else fails tinned or pouched, ie wet, cat food often does the trick. I have a feeling this is the steroids making this happen, but tonight again, as long as i put tiny amounts in his bowl, he is actually eating by himself for the first time in days..time will tell as the steroids will be out of his system by tomorrow night..but for now i am just incredibly relieved that he is managing to take something. Jacobite replied the topic: Re:Please help - all suggestions/advice welcome! I can certainly sympathise with you after our experience with Brae, it is just SO frustrating when they won 't eat. I have come across a few Whippets with this problem (not mine she's a glutton) might be worth asking the Whippet people. If it's affordable a US scan might be a good idea, but as we have discovered they are not infalable. Good luck I hope you find an answer. houndy replied the topic: Re:Please help - all suggestions/advice welcome! I think that it would be best to use the powdered slippery elm and make it into a warm paste rather than use the capsules (didn't know you could get it in capsule form). As Poppy says it coats the lining of the gut with a silky lining so stops the acid from an empty tummy doing harm. I agree with Jacobite, and would not be using any more steroids. They can be very hard on dogs - makes them very anxious and could be masking the actual cause. I thought that steroids were only to be used, on dogs, if it was a life and death situation. Dogs can live for a long time without food as long as they are getting fluids with the correct balance of electrolytes(sp?). The vet should be treating Jake and not the owner. A scan ASAP and then you have done your best. Unless you know what the cause is, it is like "boxing at shadows." Slippery elm is very good because it helps to sooth the gut, and does no damage. But there may be some internal damage? I work for a vet and steroids are widely used for all different conditions - the reason for Jake's jag was to calm down any inflammation and also it was given as pain relief. I wouldnt allow anything to be given for my sake and not the dog's..in the 16 and a half years i have nursed animals i have seen steroids save dogs' lives, so whilst they arent ideal, they do have their place. I am not a vet - I am just a very concerned lay person, who is responding to your request. I am only useing my 50 years time with animals, some very very sick, to try and make suggestions, and advice because that is what you asked for. Clearly it is just my personal opinion and it is up to you to do what ever you like. I know you will be very worried and stressed by now. I am very sorry if you do not like what I have said. I am trying to be honest and helpful. There are many different types of steroids. I have a 11 yr. old Saluki who many yrs. ago was at deaths door( in and out of consiousness, all veins collapsed, could not walk or eat) and needed steroids after she had been scanned and we knew what we were treating. She did recover from the condition that she had at the time. But now she has problems that I believe the steroids and all the drugs that had to be used at that time to save her life, have contribuated to. Site hounds are very sensitive to drugs and they can have cumulative long term efects. Best wishes for both you and Jake. I appreciate your thoughts and advice - i am trying to help Jake in whatever way i can - however i also trust the vets i work with that giving him a small jag of a short acting steroid was being done in his best interest by a vet who has worked with Greys for many years. I just didnt like the implication that any injection was given for my benefit and not the dog, however i appreciate your comments are in concern. Last Edit: 9 years 4 months ago by Kalico. The first part of the results are back and his pancreas is normal - still waiting on the other parts which should come in tomorrow...it will be decided then whether to go ahead with a scan. His drop in weight was 13.4kg to 13.05kg last week, which is probably not too bad considering how little is appetite was. Jake's results are all back now and all normal - what a relief! He is beginning to eat better as long as he is fed away from the others and is only given tiny amounts at a time. The vet suggested that we hang fire just now and dont scan/take biopsies as she now wonders whether him stressing over food/eating has caused this problem. Thanks for all your help/advice. That is a relief. We can't have the Jakester being no weel. He's probably been holding out for chipolatas! Murph the Magnificent replied the topic: Re:Please help - all suggestions/advice welcome! I can only add to what Sid said and hope he's back to his speedy best in no time. Hope he's still keeping up the eating too - even even it's only a wee morsel at a time. stussy replied the topic: Re:Please help - all suggestions/advice welcome! May be something worth checking for? Vikingxc replied the topic: Re:Please help - all suggestions/advice welcome! Ive only just seen this so sorry i didnt reply earlier. One of our Lurchers Max has a vomiting episode once in a while when he hasnt eaten in the morning, apart from this hes very fit and healthy. What a worry they are. feldandjack replied the topic: Re:Please help - all suggestions/advice welcome! 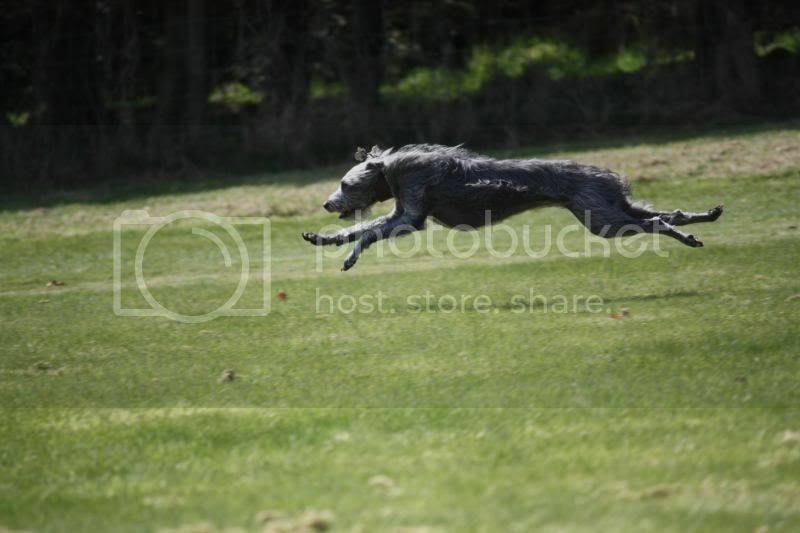 He could do with gaining a few stone to slow him down a bit at the coursing.